Background: The treatment for brain tumors, e.g., surgical treatment, radiotherapy, and chemotherapy, is finally selected based on a pathological diagnosis by biopsy. We invented a new navigation observation method for biopsy by setting an electromagnetic sensor developed for flexible endoscopes to a small diameter (1 mm) rigid endoscope. 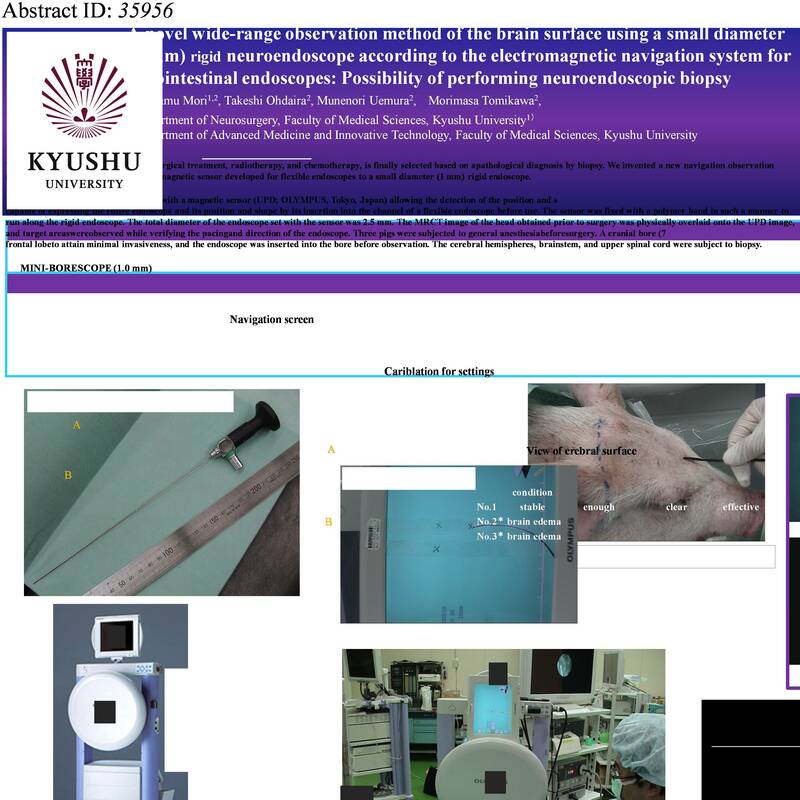 Methods: MINI-BORESCOPE (1.0 mm) was set with a magnetic sensor (UPD; OLYMPUS, Tokyo, Japan) allowing the detection of the position and shape of a small diameter rigid endoscope. The sensor was capable of expressing the entire endoscope and its position and shape by its insertion into the channel of a flexible endoscope before use. The sensor was fixed with a polymer band in such a manner to run along the rigid endoscope. The total diameter of the endoscope set with the sensor was 2.5 mm. The MRCT image of the head obtained prior to surgery was physically overlaid onto the UPD image, and target areas were observed while verifying the pacing and direction of the endoscope. Three pigs were subjected to general anesthesia before surgery. A cranial bore (7 x 7 mm) was created in the frontal lobe to attain minimal invasiveness, and the endoscope was inserted into the bore before observation. The cerebral hemispheres, brainstem, and upper spinal cord were subject to biopsy. Results: Sufficient space for visual field was ensured between the brain surface and the dura matter without injuring the cerebral parenchyma. The surfaces of the right and left cerebra, unilateral brainstem, and part of the spinal cord and cranial nerves could be observed. In two of three pigs, working space was limited by cerebral edema considered attributable to poor ventilation during surgery; biopsy was considered difficult to perform because the camera was not focused sufficiently and visual field was not clear. However, UPD-assisted navigation allowed us to observe target areas while verifying the pacing and direction of the endoscope and being aware of the proximity of the cerebral parenchymal surface. Therefore, the risk of injuring the cerebral parenchyma could be avoided with a sense of security. Fogging of the camera tip was found to have a great impact apart from the assessment of navigation usefulness. A small volume of blood made visual field poor in some scenes, which reminded us of a need for some antifogging measure of the camera lens. Conclusions: Setting of UPD to a conventional small-diameter endoscope immediately before surgery in an intuitive, short-term, and easy manner was suggested to allow the safe and minimally invasive observation of the brain surface. The removal of factors affecting working space, e.g., cerebral edema, and antifogging of the camera lens were verified to be essential requisites for the indication of neuroendoscopic observation.